These lightweight but incredibly strong shotgun and rifle cases are constructed of a 1000-denier, water-resistant ballistic nylon fabric. Our tactical long-gun cases are designed to take a beating as they safeguard your shotgun or tactical rifle from the elements. Optimal transportation and storage for rifles with or without mounted optics. 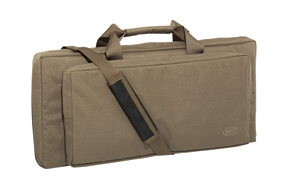 Padded to keep rifles secure and protected. Military-grade #10 YKK zippers with durable pulls and a self-healing zipper system along with adjustable interior straps for precise rifle placement. Available sizes: 36" x 12" x 3.5" and 41" x 12" x 3.5"